Foxing's Nearer My God comes out Aug. 10. Lore persists that "Nearer, My God, To Thee" was played on the deck of the Titanic as it sank, pinning the 19th century hymn to pending death. CNN's leaked "doomsday video" also featured the song, upping the drama to apocalyptic proportions. While Sarah Flower Adams' words offer rest and mercy in the darkest of hours — a song "on joyful wing, cleaving the sky / Sun, moon and stars forgot, upwards I fly" — it's a hymn that communes with the present, not the end. Conor Murphy is no stranger to mingling faith traditions with real-world consequence, but with the title track from Foxing's Nearer My God, there's a shift to wide-screen. 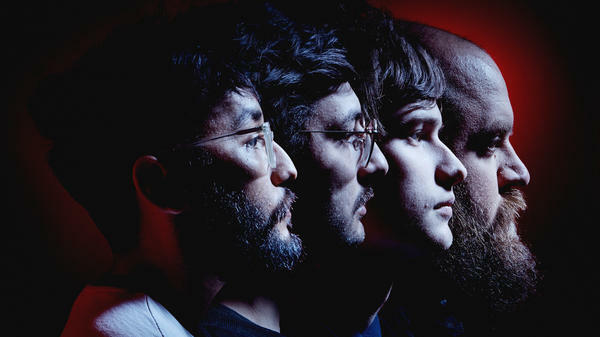 Once firmly planted in emo's twinkling moods, Foxing now stretches out to soaring heights. All thundering bass and sirens of guitar strings, "Nearer My God" is something akin to David Bowie's "Heroes" (an acknowledged influence on this record), as Murphy existentially muses on self-worth and creativity, to cleave his own portion of sky before he leaves earth. "Nearer My God" expands not just the band's sound but also its understanding of a hurting world, which is maybe why Foxing decided to offer versions sung in Spanish, French, German and Japanese, all featured in a YouTube playlist. "The language idea started as a 'wouldn't it be cool' thing that just kept going," Murphy says in a press release. "The whole point was to put in a fraction of the effort that most international artists put in. The goal was to show respect and appreciation. Each step was pretty difficult because we wanted to get it as right as possible and my only knowledge outside of English is some high school French. Each of the four foreign languages had its own set of difficulties, but, after working with 70-ish translators and friends for a few months, we've got one song in five tongues." The results are impressive, at least to a pair of ears that share the same amount of foreign language experience. Foxing wants to sound and think bigger, and this gesture beckons the world nearer. Nearer My God comes out Aug. 10 via Triple Crown Records.